BIM is a digital method for the optimal planning, construction, management and demolition of buildings. KSB supports this application and already provides planning consultants, architects and other professionals with fully usable BIM data from various KSB models that they require for their work. 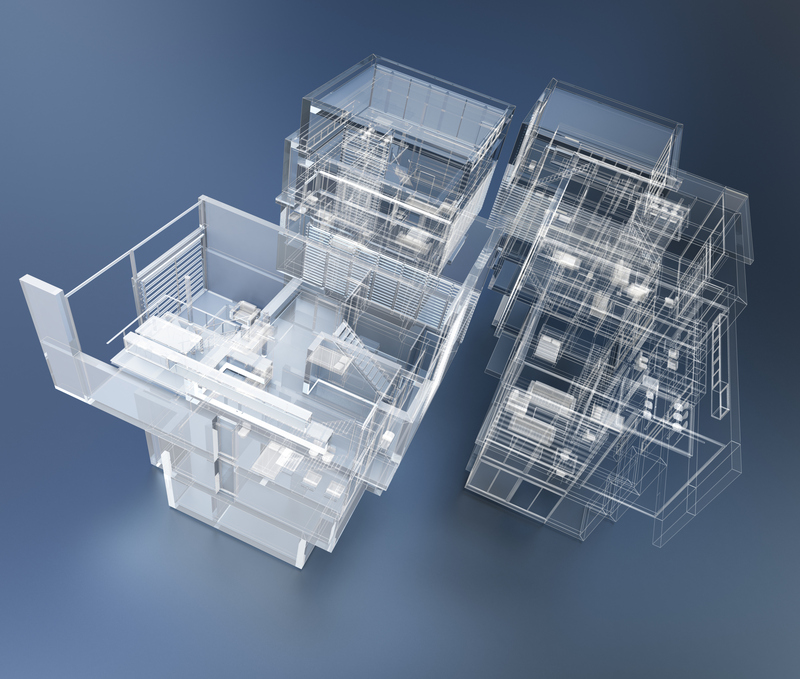 Building Information Modelling: KSB supports digital building. BIM stands for “Building Information Modelling” and describes a method for digitally mapping the entire life cycle of a building. This data enables planning, construction, building management, subsequent demolition and even the recycling of all installed elements and materials to be implemented with precision. In order to build a sustainable and fully usable BIM building model, all building data is recorded down to the smallest detail using special BIM-capable software programs. This includes the specifications of all installed materials, parts, elements and equipment as well as the exact data of sanitary, heating, air-conditioning and electrical installations. With such a virtual “Building 4.0”, planning consultants, architects, construction companies – and later also facility management and even demolition companies – have a complete database with all important information about the building at their disposal. 2D is a thing of the past. Today, planning is performed in 6D! 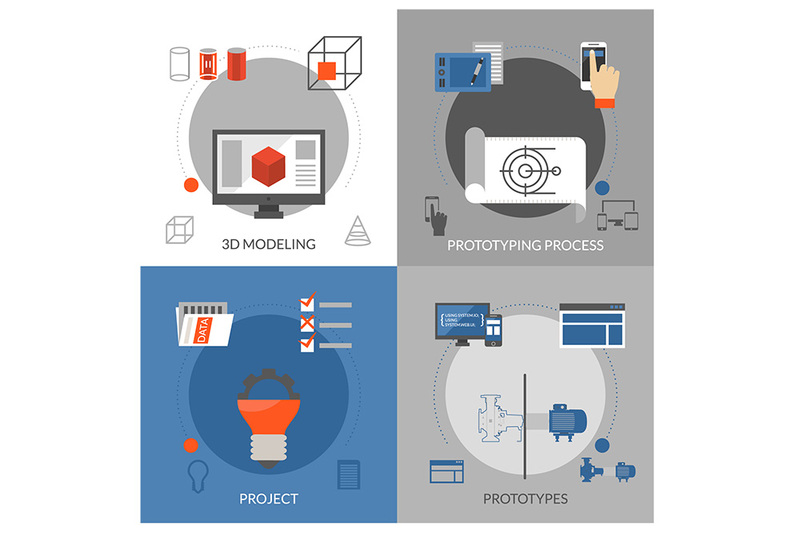 BIM means that a building is not planned using 2D drawings or 3D models as in the past, but using 6D models incorporating at least 6 dimensions. What does this mean? Who will benefit from BIM and what are the concrete advantages? Every detail of the building model can be precisely documented and thus planned, checked and implemented in a transparent way. BIM ensures seamless interplay between all trades involved in the construction phase. It allows better monitoring of the planning quality and production processes. This enables decisions to be made on a more reliable basis at an earlier stage. 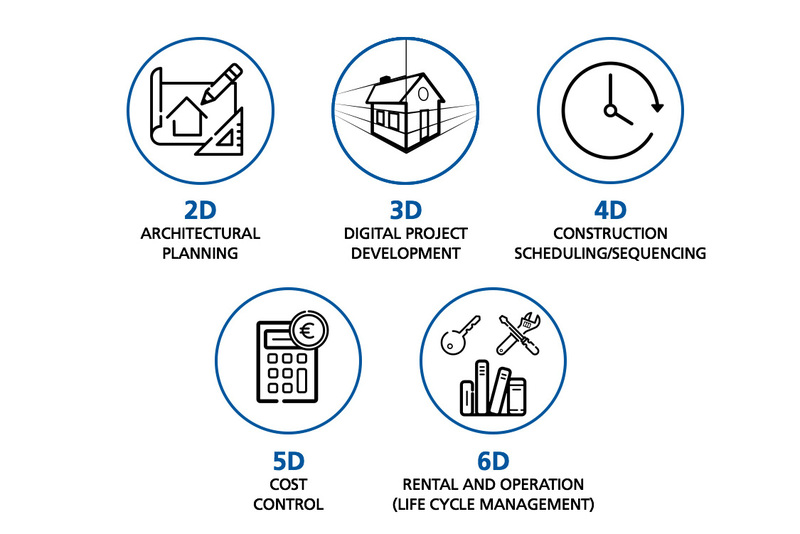 In short: if used consistently, BIM serves as a secure foundation for increased planning, scheduling and cost reliability across the entire life cycle. What is BIM’s current status on a national and international level? Some planning consultants have already mastered BIM and are integrating it into their projects – but many aspects regarding BIM are still in their infancy. Generally applicable or defined standards are not yet available, let alone concrete definitions. However, a number of institutes and committees are working to change this as quickly as possible. The VDI (Association of German Engineers), DIN (German Institute for Standardisation), CEN (European Committee for Standardization) and ISO (International Organization for Standardization) are all involved in developing uniform specifications for BIM. This is no easy task, because the challenge is huge and includes defining BIM in various contexts, standardising terminology, providing standards for data exchange and management processes and special topics such as determining quantities and facility management – a mammoth task! Until a structure is finally in place, the topic of BIM will be handled quite differently in different countries. England is regarded as a pioneer, but also France and Italy are already planning and building a lot with BIM support. December 2015 saw the responsible BMVI (German Federal Ministry of Transport and Digital Infrastructure) adopt the “Road Map for Digital Design and Construction” which is intended to promote the implementation of BIM in Germany. In this road map, the BMVI calls for “the introduction of modern, IT-based processes and technologies for the design, construction and operation of assets in the built environment”. It also describes the necessity for regulations governing contracts, close cooperation of all construction parties involved and a team-oriented technical planning approach. From 2020, these regulations will be binding. This means all projects that are subject to public tender must be planned and built in compliance with BIM! And this makes it all the more important to be prepared for these challenges. From rough to fine: What does the level of detail mean? The information data, i.e. all other documentation on the product: material, electrical system, efficiency, power input, operating manual, etc. Ready for BIM? KSB is working at full speed on its data records. At KSB, we recognised the need to provide our partners with valid BIM data a few years ago. In addition, the BMVI announced that public buildings such as pumping stations, waterworks etc. would soon only be constructed in compliance with BIM criteria – a requirement which, by the way, already applies in some countries of the world or will apply soon. One more reason for KSB to address the topic as a matter of urgency. Which data is currently available for download at KSB? We are currently concentrating on providing data that can be used by planning consultants and architects independently of manufacturers and software. We work closely with our software partners (as providers) and specialist planning consultants and architects (as future users). The CAD data of our products is already completely available – this corresponds to a LOD level of 400 to 500. In other words, the data of information family 1 is already available for all our products at the click of a mouse. KSB today already offers BIM data records for a large part of the standard products (pumps and valves) used in building services. And, of course, we are continuously working on incorporating further product families. There are currently various options for those interested in accessing KSB’s BIM data: e.g. via mirrored catalogues on vertical marketplaces or via apps from Cadenas. But the easiest way is directly via KSB’s own CAD platform! But simply offering BIM data for download is not enough for us. We would also like to make our customers “BIM-ready” by organising seminars for consultants, events, project presentations and BIM training courses with a partner company.